I’ve been in the mood to branch out a little with my cooking lately. I’ve spent quite a bit of time in my local spice shop, tasting, smelling, discussing, and being inspired. If you are in Boulder and haven’t yet made it into Savory Spice on Broadway off the Pearl Street Mall, you should really stop in someday when you have a little time to browse. I haven’t had the pleasure of experiencing that many different cultures, so this is my way of connecting to people in other areas of the world and I find that so many of their staple foods have a very strong appeal for me. Both beans and rice can benefit from soaking – this is mildly controversial, but I’m giving you my opinion based on my experience. About 8 hours before you plan to cook the Lubiya, soak them in separate bowls in enough water to cover by an inch or two. You can also add a strip of kombu to the soaking water of the black eyed peas. When you are ready to cook your Lubiya, drain and rinse your black eyed peas and rice, keeping them separate, and set aside. In a large soup pot set over medium heat, saute onions in olive oil until lightly browned, then add leeks and continue to cook. When the leeks begin to brown, make a well in the center, pour in a little more olive oil, and saute the minced garlic and cumin for a minute or two until it’s very fragrant. Stir it all together, then add the celery, minced chili pepper, water, paprika, and turmeric. Bring to a boil and then turn the heat to medium low and cook until the beans are as tender as you like them. You can expect that to take about 1 1/2 hours, but that really depends on the age of the beans and your altitude, so don’t hold me to it! Meanwhile, cook the rice . If you’ve soaked it, put it in a medium pot with the olive oil, saffron, salt, and water in the proportions given above. Bring to a boil, then turn heat to medium low and cover to simmer for 30 minutes. If you didn’t soak it, follow the rice:water ratios provided on the package. as well as the cooking time. Now it’s time to finish the soup. Once you add the acidic ingredients (tomato and lemon) and the salt, you might find that the beans won’t soften any more, so be sure they are soft enough before you do that. The rice is fine sitting in the pot until you are ready for it. Add the tomato, lemon, salt and pepper and simmer for about another 15-30 minutes (or more). Taste, adjust seasonings, and serve over rice with some yummy za’atar spiced bread. Enjoy! Last weekend, I had the pleasure of providing lunches for a yoga teacher training. Doing Kundalini Kriyas from 7am to 7pm four days in a row builds up quite an appetite, as you can imagine, so I wanted to offer a good array of foods in good amounts to keep them nourished throughout the day. I was asked to provide salad each day, among other things, which was a bit of a challenge for me, because I typically don’t make/eat salads in the colder months. Requests like this that are outside my usual norm can provide such wonderful inspiration and that’s exactly what happened. I did provide raw green salads each day, but as the days went on, I realized that I needed some heartier salads and sides as well. This salad is simple and delicious. Of course, it requires a little prep if you don’t have cooked quinoa and sweet potatoes on hand, but I usually either have them or want them in my fridge, so I either use leftovers or cook extras and have leftovers for something else. Even if you start from the beginning, this will only take you an hour to prepare, max, with only about 15 minutes of your attention required. Doubling or tripling it won’t add much to the prep time, and it’s a great dish to bring to a potluck. I’m going to provide the basic recipe, but there are many options for creating more complex flavors with spices or garnishes – I made a Southwest version to go with my Chile-Lime Vegetable soup, but I know I’ll make many other versions of this in the future. For a Southwestern flavor, use minced red onion instead of the shallots, lime juice instead of lemon juice and sprinkle with pepitas; use cilantro instead of parsley, if you wish. For an African version, add up to 1 Tablespoon freshly grated ginger and Berbere spice (start with 1/2 teaspoon – amount will highly depend on the heat of your particular blend; if you don’t have Berbere spice, try 1/4 to 1/2 teaspoon each ground allspice, fenugreek, coriander, cardamom, paprika, and cayenne, or as close as you can get with what you have on hand). For an Asian flavor, add up to 1 Tablespoon freshly grated ginger, use 2 Tablespoons brown rice vinegar instead of the lemon juice, tamari instead of salt, and add a splash of toasted sesame oil; garnish with crushed nori. For a Moroccan version, add 1/2 to 1 teaspoon each ground tumeric, cumin, and cinnamon, stir in about 1 cup of chopped tomatoes, and garnish with cilantro. For a Spanish version, add 1 teaspoon minced garlic to the shallots about 1 minute before you stir in the spinach and spice with 1/2 teaspoon crumbled saffron threads and 1 2 teaspoons smoked paprika. If you haven’t already, get the sweet potatoes roasting and the quinoa cooking. Meanwhile, saute the shallots in olive oil until they are just beginning to brown, stir in the spinach and cook until the spinach is just wilted. When the quinoa is ready, dress it with the olive oil, lemon juice, and salt, then stir in the parsley and crushed red pepper. Taste and add more lemon juice, salt, and/or pepper as needed. Stir in the roasted sweet potatoes and garnish as you wish. Enjoy! Samosas are savory stuffed pastries thought to have originated in Central Asia. They have been around since before the 10th century, so the concept has spread and different cultures have adapted them to their own regional cuisine. I think that they are probably most widely known here in the US as fried turnovers filled with a spicy potato and pea mixture. 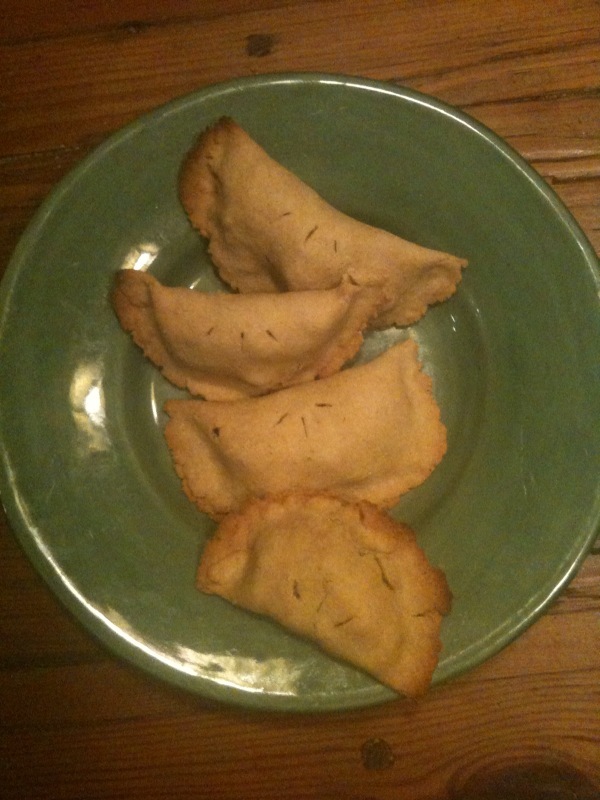 My version is made with a chickpea pastry, rather than the usual wheat-based dough, and filled with coconut curry vegetables. I think they are delicious, and what a bonus that they are also healthy and portable. The chickpea pastry is quite easy to work with and you could use anything you want for a filling – this is a great use for leftovers. Be inspired and have fun! To make the filling: place the potatoes, coconut milk/water, ghee, curry powder, and salt in a sauce pan. Bring to a boil, then turn heat down and simmer, partially covered, for five minutes. Add the carrots and continue to simmer. When the potatoes are nearly soft, add the scallion, cabbage, and kale and continue to cook for another five minutes. Add the peas and cook a minute or two. Taste and adjust seasonings, as necessary. To make the pastry: if you have a food processor, place the flour and salt in the bowl fitted with the metal blade and pulse a couple times to combine. Add the olive oil and pulse a few more times until the oil is dispersed. Continue to pulse, adding the water a little at a time until the dough balls up. If you are making it by hand, mix the oil in with a fork, then switch to a spoon when you add the water in. It is ready when it sticks together, but isn’t sticky, when you pinch it between your fingers. Knead a few times with your hands. It should make a smooth dough and hold together without cracking. Preheat the oven to 350 degrees and grease 2 baking sheets. Divide the dough into quarters. Cover three of the quarters with a barely-damp cloth and cut one quarter into 6 pieces. Roll each piece into a 3-inch round and put about 1 Tablespoon of filling in the center of each. Use your fingertips to brush a little water around the rims, then fold over and seal. Repeat with the remaining dough and bake them until they are lightly browned, about 15 minutes. Serve hot and enjoy!